As winter approaches you may ride a little less than normal. Which is understandable, many of us are not real fond of riding in the snow and ice. So the question is should you drain your gas from the motorcycle or just put a stabilizer in it? There are a few opinions on the best method, but here are some basics to get you started. Gas tanks have a tendency to rust if they are not used. A full tank of gas will prevent the metal from exposure to air along with avoiding extra moisture on the walls of the tank. Sta-bil, Star Tron, Seafoam Fuel Additive, Spectro FC Premium Fuel Conditioner & Stabilizer. These fuel treatments will help stabilize your fuel. Be sure to follow the directions on the bottle. If you choose this option, then you will need to treat the tank with fogging oil to coat the inside of the tank. You should also do this for carbureted motors; spray the fogging oil directly into each carburetor. There are many YouTube video’s that will help you to tackle the job. A search for the term how to store your motorcycle and fuel will bring up many opinions on how to do it. But most will agree that a fuel additive with a full tank of gas is the best bet. Also draining the carburetor and fuel lines is a good option. 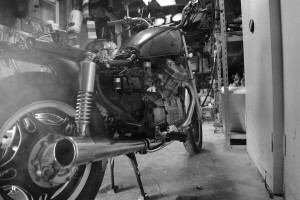 Many diehard riders will also start and run their motorcycles about once a week to keep things lubricated, if you don’t want to drain the carburetor. Besides the gas, a couple of other items will need your attention. Battery: The battery should be disconnected and placed on a battery tender. Change the Oil: It may cost a little more but changing the oil at the end of the season will mean that you have clean oil sitting around all winter. Used oil can have water and other contaminants in it, so get it out of there. It’s more expensive but in the spring, before you start riding, change the oil again. Tires: To preserve them lift them off the floor, put your bike on a stand. Rodents: Do whatever it takes to keep the rotten things from eating your wires and plastic parts. i.e. : traps or poison, of course keeping in mind the safety of pets and kids. Last of all, cover up your motorcycle and put it to bed. Sit back read a couple of motorcycle magazines, spend time with the family and before you know it the spring riding season will be here!